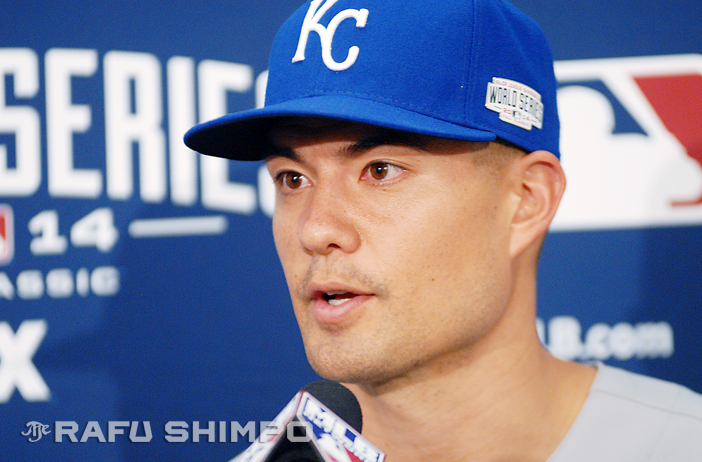 UPDATE: Jeremy Guthrie lifted from the game in the top of the third inning; Game 7 tied, 2-2. Prior to his win in Game 2 of the World Series last Friday, Royals starter Jeremy Guthrie said a large part of winning is being able to get your team rolling. Words to live by for sure, as the 35-year-old Nikkei pitcher will take the mound tonight in what will be the biggest games of his career thus far, and the biggest for Kansas City in nearly three decades. The Royals forced a winner-take-all Game 7 by thumping San Francisco last night, 10-0. The Giants had seized momentum in a big way, scoring 15 unanswered runs in Games 4 and 5 at their home field. Guthrie, who is making the most of his first postseason in his career, will oppose 39-year-old Tim Hudson for tonight’s season finale. Guthrie and Hudson were both sharp in their game Friday, a 3-2 win for the Royals, but the much-touted Kansas City bullpen lived up to its billing and held on to the lead. Tonight, Royals manager Ned Yost is again hoping that Guthrie can go deep into the game to allow his sterling staff of relievers to take over. He was able to rest most of his bullpen arms, thanks to last night’s brilliant start by rookie Yordano Ventura. In the Royals’ last World Series appearance, they also trailed three games to two heading back to K.C. And like 1985, they managed to eke out a win – against St. Louis in that year – to force a Game 7. The home team won that final matchup, and needless to say, the Royals and a good chunk of Missouri are hoping that history repeats itself.